Marriage shouldn't be entered into lightly. That's why we developed Preparing for Marriage--to help engaged couples prepare for building a Christian marriage. This study guide includes six fun, practical sessions and five special projects that will prepare couples for loving, lasting marriages firmly established in Jesus Christ. Best if used with a mentoring couple, but you may use it on your own. 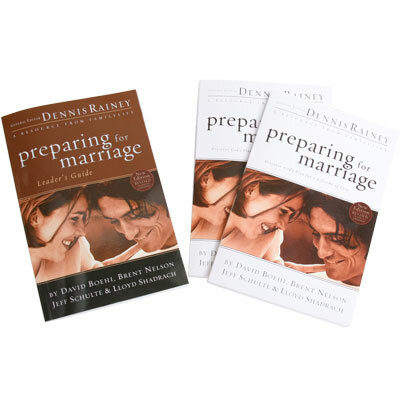 This leader's guide is a supplement to the Preparing for Marriage study guide. It is an invaluable tool for pastors, Christian marriage counselors, and mentoring couples to help engaged couples build from the bloom of new romance the vision of a lasting marriage firmly established in Jesus Christ. David Boehi is a senior editor at FamilyLife and editor of the HomeBuilders Couples Series. He is a graduate of the University of Missouri journalism school and has served with Campus Crusade for Christ since 1976 and FamilyLife since 1988. He and his wife, Merry, have two married daughters and live in Little Rock, Ark. Brent Nelson is a graduate of Trinity College, and earned masters degrees from Indiana University and Trinity Evangelical Divinity School. He worked for many years with Campus Crusade for Christ and FamilyLife, and is now involved in church, vocational, and adoption ministries. He and his wife, Cass, have four children and live in Franklin, Tenn.
Lloyd Shadrach is a teacher in residence at Fellowship Bible Church in Brentwood, Tenn., which he co-planted in 1997. Previously he worked with FamilyLife for 13 years. Lloyd is a graduate of Dallas Theological Seminary. He and his wife, Lisa, live in Franklin, Tenn., with their three children. Jeff Schulte is a fellow and director of the Sage Hill Institute, an initiative for authentic Christian leadership. He is a graduate of Yale University, earned two masters degrees with highest honors from Western Seminary, and speaks nationally and internationally on biblical masculinity, fatherhood, spiritual formation, leadership, and relational authenticity. He and his wife, Brenda, have six children.